Investment apps are growing to become one of the top options for new investors to get involved in the stock market. And even experienced investors may find opportunities to save money and improve their portfolios with one of the available investing apps. While you used to have to pick up a phone and call a stockbroker to make a trade, which came with a steep commission, now you can pick up your phone and tap your screen a few times to trade instantly—either for free or at a relatively low cost. Whether you want to buy your first stock or you’ve been doing it for years, consider these top investment apps that are poised to be top performers in 2019 and beyond. Sir Robin of Locksley, better known as Robin Hood, became a famous character for stealing from the rich and giving to the poor. If you like the idea of empowering everyone to get into the stock market, Robinhood is a favorite option. Robinhood offers free stock trades. And “free” doesn’t mean “free, but with fees and other costs.” Trades have zero commission. Just download the app, connect to your bank, fund your account, and you can trade fee-free. For extended trading hours and margin accounts, you can upgrade to Robinhood Gold for a fee. 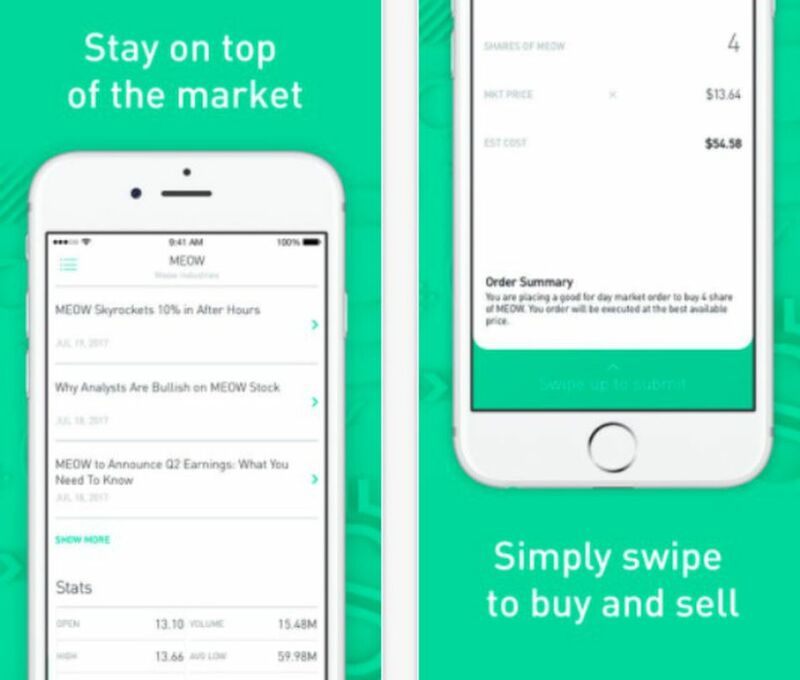 Robinhood is essentially a no-frills online stock brokerage. Because they don’t have fancy offices around the country, they can run a lower cost operation and pass on the savings to investors like you. The company makes money from Robinhood Gold users and earning interest on account cash balances. Interested in reading more reviews? Take a look at our selection of the best stock trading apps. If you don’t want to think much about your investments but want to contribute regularly, Acorns is a top option. Link a debit or credit card to the app and Acorns will “round up” your transactions to the next dollar and invest the “spare change” you would have received had you paid in cash. Acorns invests your funds automatically in one of five professionally managed ETF portfolios. Accounts with a balance up to $5,000 pay just $1 per month and accounts with a balance over $5,000 pay a competitive 0.25% fee. For college students with a .edu email, you can use Acorns for free for up to four years from the date of registration. The existing portfolios focus on low-cost exchange-traded funds that offer you diverse investments without a giant starting investment. A few dollars here and there adds up, and Acorns makes it easy to invest at small dollar levels. Check out our guide to the best stock market apps you can buy today. With identical pricing to Acorns, Stash offers a low-cost method to build a diverse portfolio. But where Acorns invests for you automatically, Stash can help you learn how to make the best investment decisions yourself. The Stash app includes educational content customized to your investment preferences. You can choose between values-driven portfolios focused on different investing themes, or build your own custom portfolio. Then you can set up an “Auto-Stash” plan for recurring investments or add funds when you choose. For any beginning investor, all of the terms, acronyms, and phrases of the investment world can be overwhelming. Stash does not give the depth of research on companies that many stock brokerages do, but if you don’t yet speak the language of investing, you have to start somewhere. Stash is an excellent choice for a starting point. When money is deposited into your account through a freelance job, the Vault app gives me a notification to approve depositing the percentage you picked in your IRA account at Vault. You can also choose to invest your percentage automatically without requiring manual approval. Vault uses the same pricing model as Acorns and Stash. Stockpile offers a unique approach to buying and selling stocks. You can buy fractional shares of nearly any company through Stockpile. Alternatively, you can fund an account with a stock gift card that gives the lucky recipient shares of stock starting at $5. There are no monthly fees and all trades are 99 cents. This app is especially exciting for parents or grandparents looking to get kids or young adults interested in investing and the stock market. Instead of giving a gift card that they will blow shopping, you can give them $20 of your favorite stock. Stockpile offers over 1,000 investments include single stocks and ETFs. For example, you can gift shares of a stock like Disney or Apple, or give a basket of stocks in a Vanguard, iShares, or other ETF. You can give e-gift card or physical gift cards or fund an account through a bank transfer. This is a gift that literally pays dividends. Clink is a savings-based app that invests your funds into a portfolio of Vanguard based Exchange-Traded Funds (ETFs) based on how aggressive you want to be with your investments. You can schedule a certain percentage of your purchases to be added to your Clink account after transactions. Say, for example, you spend a lot on dining. You can opt to have 10% of your dining purchases transferred to your Clink account each time. You can also schedule regular transfers from your checking account to your Clink account. With Clink, there’s no minimum investment amount — just a $10,000 daily limit. There’s a $1 monthly fee for portfolios up to $5,000 and a 0.25% fee on balances above $5,000. TD Ameritrade is one of the biggest and most recognizable brokerages. The TD Ameritrade app is available for iOS, Android, and BlackBerry. The app is free to download and there’s no account minimum to get started. Watch over 20 educational videos to gain additional investing knowledge. You can even set price alerts to receive a notification when your investments hit a specific price points. There’s no minimum deposit to open an account which means you can start investing with any amount. There’s a $6.95 fee for each trade. In addition to managing your portfolio through the mobile app, you can also login online to access additional features. Wealthfront is for those who want to use passive investment to build wealth. The app includes some built-in intelligence to help you maximize your investments, but also to invest based on your risk tolerance. Start by connecting your most important accounts to the app and it analyzes your spending to learn about your finances. It takes into account your spending and your goals to create a strategy personalized just for you. The app invests your money into up to 11 ETFs, rebalances periodically based on deposits and market fluctuations, and even offers a 529 College Savings Plan as an investment option. It even has a few extras features like tax loss harvesting and direct and advanced indexing. The Wealthfront app is free for the first $10,000 you invest. After that, it’s 0.25% per year. There’s a $500 minimum balance requirement.